An aerial view of Fort William Historical Park after a spring flood. The historical park sits on the Kaministiquia River in the city of Thunder Bay. Fort William Historical Park is a reconstruction of the Fort William fur trade post in 1815. Buildings sit in neat rows surrounded by lush green trees. 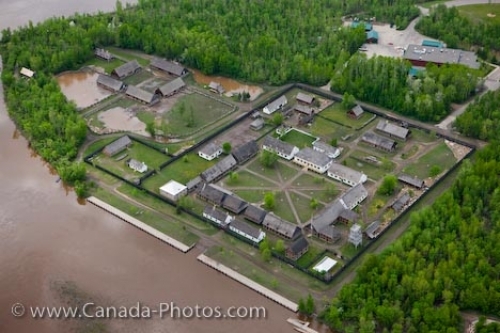 Fort William Historical Park on the bank of the Kaministiquia River in the city of Thunder Bay after spring flooding, Thunder Bay, Ontario, Canada.